Every Sunday, I sit on the sofa with a cup of tea and my blankie, and I read the newspaper. Arguably the best part of the Sunday paper, after the triple sudoku, of course, are the sales ads. Most weeks, tucked between the Kohl’s ad and the Best Buy circular are a couple of packets of coupons. 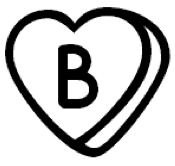 The hubby and I don’t use 80% of the products in the coupons. It seems a shame to throw all those savings in the recycle bin each week. So for the last two weeks I have clipped the coupons with the biggest savings. Monday after work, I furtively slunk around Walmart, affixing the collected coupons to their respective products. All in all, I left $30 worth of savings opportunities in my wake. Hopefully, my simple little coupon operation will be a welcome surprise to some unexpecting shoppers. In the future, I’ll be sending my unwanted coupons to our troops overseas, who can use them in the base commissaries even after they have expired. 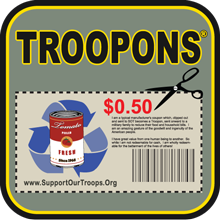 Support Our Troops® has a coupons for the troops program, Troopons®, that simply asks me (and you!) 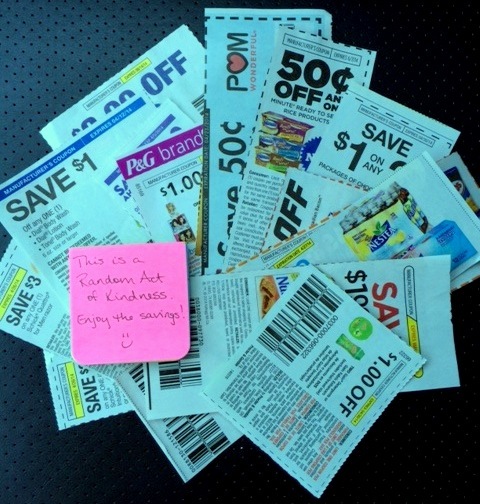 to cut out the coupons, sort them into expired or unexpired, then sort both groups into four main categories before bagging them up and mailing them to the program headquarters for distribution. I’ve seen for myself how much young military families living overseas appreciate these coupons. If you have unwanted coupons and a little extra time, click here to find out how you can get involved with Troopons®.